She designs the most adorable patterns. I am very lucky to have been gifted her Woodland Knits book by another Ravelry member. And oh my word - it has the most fantastic designs in it. All magical and whimsical - I love them all! and there you'll find the friendliest bunch of people. And the swaps that take place are brilliant. The most recent one I took part in was the ***Midsummer Magical Mini Swap***. This was a small swap to include something created for our partner. there obviously was some knitting and lots and lots of felting involved to produce it! It was an amazingly easy pattern to knit up and it knitted up beautifully. 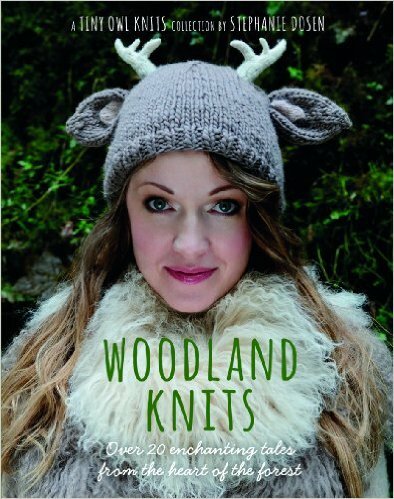 You even knit some leaves that go on the strap - how cute are they?! Once knitted it had to all be felted. Instructions were to felt as if washing your hands with the knitted item in your hands. (having used a rose scented handwash)! I find felting fascinating, just to see the item you've knitted fuse together and become felt. My USA partner I sent it to said she loved it. I do hope so! And I'm definitely going to make it again ... only this time, hopefully, for ME! However .... I was very lucky and thoroughly spoiled by my partner who sent from Finland. She knitted me a pair of mittens (also in the Woodland Knits) called Catching Butterflies. I love them and feel very lucky to have had them made especially for me!